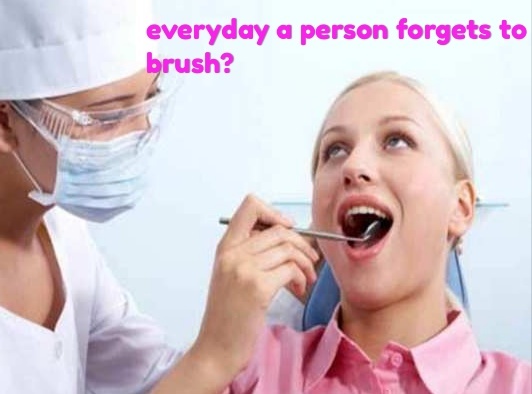 Everyday a person forgets to brush:? People are not very aware of the cleanliness of the teeth. In a survey conducted in the UK, it was found that only nine percent of the people think that it is important to take care of mouth health. You would think that only children are careless about teeth cleaning. But then what if you find out that in every three, a person often forgets to brush his teeth. Yes, this claim has been made in a research done in the UK. Researchers studied this among 2,000 adults and found that many of these are not particularly aware of the cleanliness of teeth. They also do some special work to keep their teeth and mouth healthy. One of the 10 said that they clean their teeth by chewing gum instead of toothpaste. 80 percent of the people believed that they are currently undergoing oral problems or have been patient. These problems included the sensitivity of teeth (33 percent), cavities (32 percent) and the problem of bleeding from the gums (31 percent). Only nine percent of the people in the survey believed that the health of the mouth is a critical place. This condition is when mouth-related health problems are considered the most common and long-standing diseases in the world. When the priorities of healthy lifestyle were asked from those involved in the survey, the number of mouth care came in a lot later. Earlier, diet, weight and mental health were kept. The survey conducted by a toothpaste company also found that 43 percent of the people did not have the information that there are ways to keep mouth healthy. Dentist doctor Milad Shadruh, who participated in the survey, had to say, "Most people believe that oral health means only dental care, whereas there are many bacteria in the tongue, cheeks and gums. They also need care in the same way as tooth-free, only then the complete health of the mouth will be achieved.